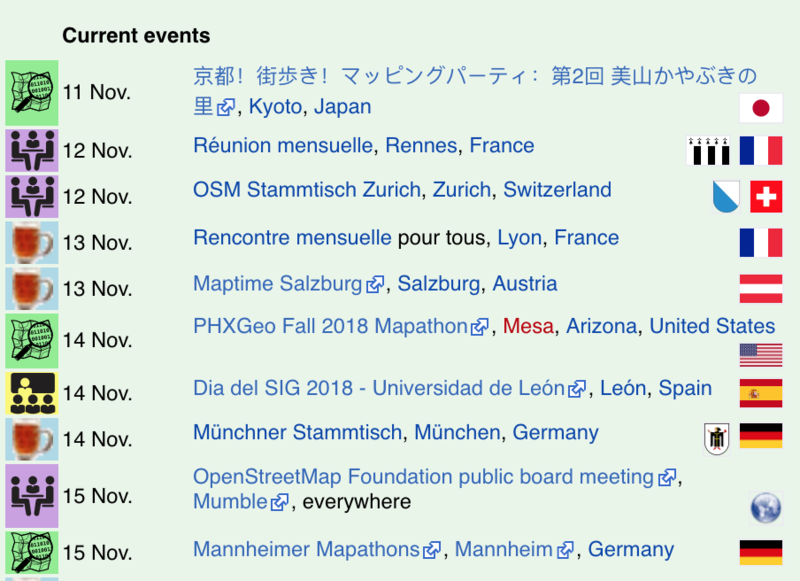 The OpenStreetMap Wiki serves as documentation for the project, good for finding how to label/tag things in the map data, and communities around the world. It has various guides, articles on software choices, and gets into the technical detail of servers. Talk-GB Mailing List is a gathering for detailed discussion on UK OpenStreetMap. Browse the past threads for a feeling of what is discussed. Learn OSM is a resource created by the Humanitarian OpenStreetMap Team. Whilst we hope that the UK will not be requiring humanitarian assistance, the beginners guide is useful to new starters. The worldwide calendar of events includes listings for regular UK pub meetings in the East Midlands and London, as well as one-off events like Missing Maps Mapathons. The annual State of the Map conference is an opportunity over a few days to get really involved. The 2019 conference will be in Heidelberg, Baden-Württemberg, Germany on 21-23 September 2019. it would be good to have lots of people from the UK attending and presenting. The Overview of OpenStreetMap Contributors aka Who’s Around Me? can be used to find mappers near you.